Dammit. This was not the post I planned to write today. Yesterday evening, Fr. Matthew Baker, an Orthodox Christian scholar, priest, husband and father, died tragically in a car accident on his way home from one of the vespers services that happens each Sunday of Great Lent in our tradition. I knew him: not well on a personal level, though I count as friends many, many who did. I am grieving, for many reasons, one of which has compelled me to reflect with public words. Fr. Matthew represented something rare in the academy. He was first and foremost a person of faith, yet with an intellect that was incredibly vast and complex. During his studies, he attended and/or lived at four Orthodox seminaries in our country, one of which is my husband's alma mater and present employer. Fr. Matthew was also very close to completing his PhD in theology at Fordham University. A look at his Academia.edu profile will illustrate how prolific Fr. Matthew's scholarship is. He was becoming--or perhaps already had become--the foremost scholar on the subject of Fr. Georges Florovsky's life, work, and theology. I used a small, yet significant essay of Florovsky's as source material in my Master's thesis on the relationship between knowledge and Christian worship. Though I have not delved deeply into the greater works of Florovsky, I am acutely aware of the contribution Fr. Matthew's work has made, is making, and will continue to make in the academic discourse on contemporary Orthodox Christian theology. The American Church, as well as the academy, has lost a light in Fr. Matthew. There are many reasons I am grieving right now at his death, even though I did not know him well personally; I am grateful, however, for the small handful of multi-person conversations I shared with him on a few occasions. The reason I wanted to touch briefly on here, because it is absolutely relevant to the project of this blog, is the loss in Fr. Matthew of a scholar who was capable of rigorous engagement in the public fora of ideas, while yet remaining authentic to the person he was, made in the image and likeness of God...and even further, that in and through his engagement with the diversity of ideas one encounters in any area of the academy--perhaps even especially one that sounds (though is not) as homogeneous as contemporary Orthodox Christian theology--he always, always, maintained his ability and desire to understand the ideas he encountered as coming from persons also made in the image and likeness of God and worthy of love--so even when he disagreed with the ideas themselves, he loved and respected the persons from which they came, which was made clear in his words, attitude, and actions toward them even amid the rigorous engagement that was his hallmark. This is something I aspire to in my work with both colleagues and students, and in my life as a whole. And I grieve the loss of a role model in this very complicated, often challenging endeavor. My work is in many ways different from the scholarly work Fr. Matthew was doing leading up to his untimely death. My terminal degrees are at the Master's level; he was very close to completing his PhD. My primary discipline is library and information science; his was theology. 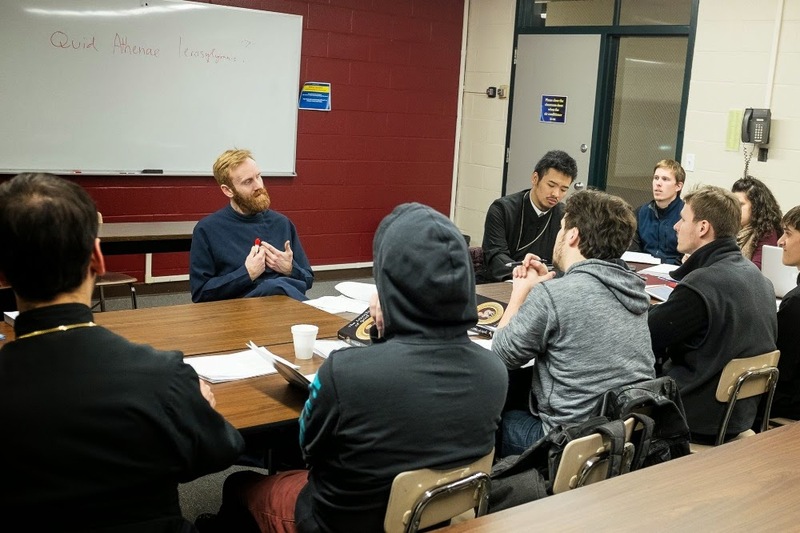 Jesuit higher education is an incredibly special thing, because it synthesizes exciting and rigorous intellectual endeavor with the better version of ourselves, formed to love and serve God and others. 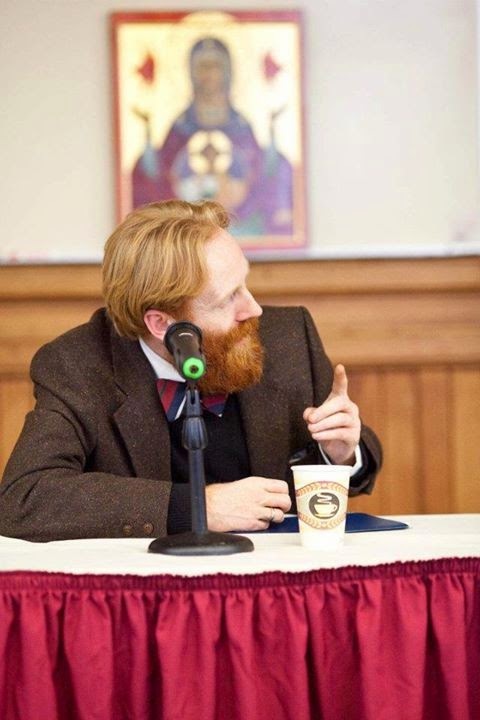 Though the Orthodox Christian faith is distinct from the Roman Catholic faith that is part of the institutional mission and identity at both Scranton and Fordham, the Jesuit focus on intellectual engagement whose goal is to transform participants into men and women for others to the Glory of God means that Orthodox Christian scholarly folk like Fr. Matthew and myself (and a significant number of other scholars in our shared circle of colleague-friends) are invited to bring our whole, Orthodox Christian selves to the intellectual table in these communities. Even when what we have to say is very different from what has been said until now. Fr. Matthew understood both the value of this welcome, and the responsibility it entails. I already recognize the value, and can only hope I grow into the responsibility through my work moving forward. Fr. Matthew leaves behind his widow, Katherine, and six children. His children were in the car with him when the accident occurred, and witnessed their father's violent death, though they were not seriously physically injured themselves. A fundraising campaign has been set up to help support the Baker family at this unimaginably heartbreaking time in their life. Please consider giving if you can.